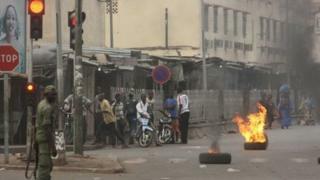 Renegade soldiers in Mali have looted the presidential palace in the capital, Bamako, after a coup. The coup leaders went on state TV to announce that they have seized control of the country and closed the borders. A government official told the BBC that President Amadou Toumani Toure is safe and not in the custody of mutineers. There has been widespread international condemnation of the coup, with the African Union describing it as a "significant setback for Mali". The UN Security Council called for the "immediate restoration of constitutional rule and the democratically elected government". The World Bank and African Development Bank announced they were suspending all aid until the crisis is resolved. The mutiny comes as no surprise. Last Friday, Ecowas made an announcement that it is going to support, militarily, the national army to defeat the Tuareg. Discussions are still under way but they need to go beyond discussions and act promptly. The region is still failing to anticipate early warning signs, such as the downfall of Libya's [former leader] Muammar Gaddafi and the anticipated impact this would have on security in the Sahel. African leaders need to choose when it is proper for dialogue and when it is proper to protect the territorial integrity of the country using the means that are at their disposal. President Amadou Toumani Toure failed to anticipate this and I think most African leaders failed to advise him wisely on this issue. Kenya's Foreign Minister Moses Wetangula and his delegation are stranded in the country, as Bamako's airport is closed, after attending an AU meeting on peace and security. The West African regional body Ecowas said the mutinous soldiers' behaviour was "reprehensible" and "misguided". The soldiers, calling themselves the Committee for the Re-establishment of Democracy and the Restoration of the State (CNRDR), said they would hand over power to an elected government. "The objective of the CNRDR does not in any way aim to confiscate power, and we solemnly swear to return power to a democratically elected president as soon as national unity and territorial integrity are established," they said in a statement. The soldiers said they had led Wednesday's mutiny because the government had not giving them enough arms to tackle a rebellion by ethnic Tuareg in the north of Mali. They attacked the presidential palace, traded gunfire with soldiers loyal to the government and took over the state radio and TV broadcaster in Bamako and took it off air. After several hours of footage of traditional Malian music and dancing, a group of soldiers appeared on screen early on Thursday morning. The leader of the mutiny was revealed to be Capt Amadou Sanogo, who appeared briefly to announce the imposition of a national curfew, although he did not specifying the time and said the constitution had been suspended. The BBC's Martin Vogl, who is in the capital, says soldiers were seen taking televisions and other goods out of the palace following the coup announcement. Our correspondent says it is possible that the coup may falter, pointing out that the mutinous troops are poorly equipped, led by a mid-ranking soldier and they do not have the backing of all Malian forces. The well-trained and organised Red Berets unit is loyal to the president and he is believed to be under their protection, our reporter says. If those officers decide to push back, they could perhaps overturn the coup, he says. A source told the BBC that the foreign minister and a number of other ministers had been arrested by the renegade soldiers. A government official, who told the BBC the president was safe, did not give any further details about his whereabouts. Mali has had democratic rule for the last 20 years, during which it has come to be considered as a model which other emerging democracies can look to. The unrest began on Wednesday as the country's defence minister started a tour of military barracks north of the capital. Soldiers upset with the government's handling of the Tuareg rebellion fired in the air during the inspection, prompting an immediate strengthening of security around the presidential palace. Are you in Mali? Have you been affected by the events in Bamako? Please get in touch using the form below.